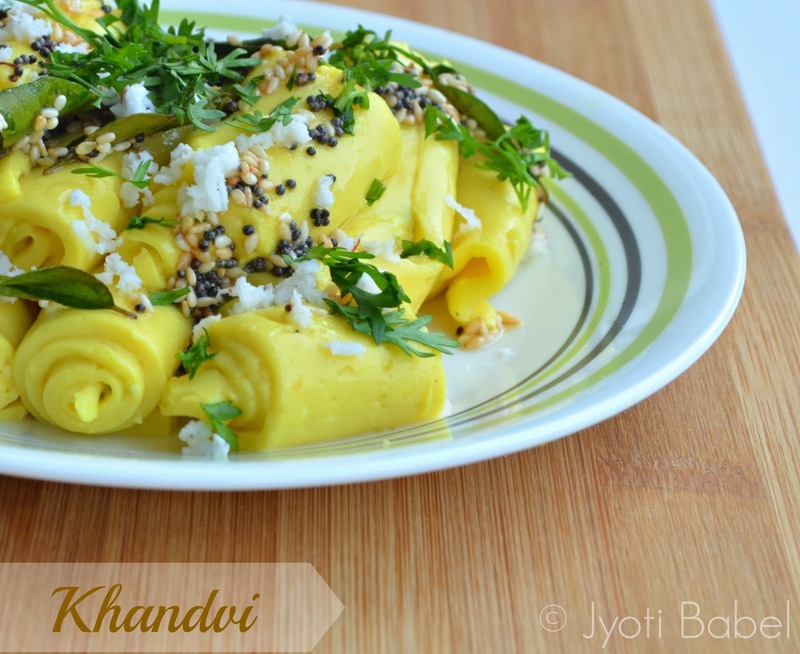 Khandvi is one of those dishes which you will either love or hate. I belong to the former group. This Gujarati delicacy requires a bit of patience to make. With some practice, you can get thin layers which literally melts in the mouth when you eat it. Even if you don't get super thin layers don't worry. Believe me, it doesn't really make much difference to the final taste. My maternal grandmother makes a similar dish which we call 'pithod' or 'patindri'. She makes it in a single thick layer and cuts them in diamond shapes. It is then topped with tadka and the garnishing. One has to prepare the batter for khandvi and cook it until it is just right to spread. If you do it wrong there, the batter won't set at all. I do a simple test to know if the batter is cooked enough. For that, I just drop a small spoonful of the cooked batter and spread it. If it sets in one minute then I know that the batter has cooked enough for spreading. 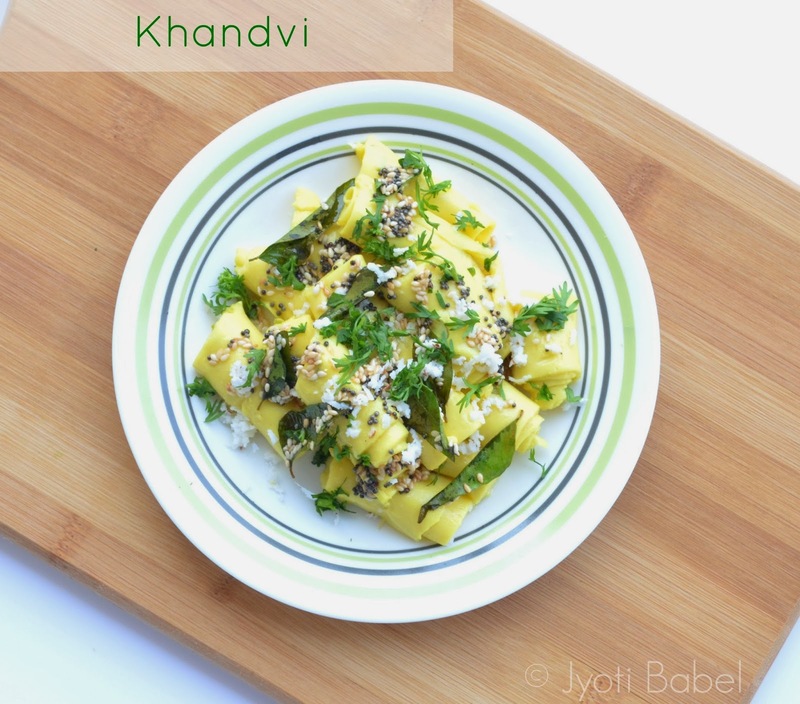 Let's hop over to the recipe for Khandvi now. 1. Seive the gram flour/besan such that there are no lumps in the flour. Mix together the yogurt and water. Grease the back of 2-3 large thali or your kitchen counter top. We will need it to spread the cooked khandvi batter. 2. In a large bowl add the gram flour, turmeric, asafetida, chili ginger paste, salt, and the besan-yogurt mixture. Whisk to form a smooth batter. 3. Heat a large pan and cook the batter on medium heat stirring it continuously. In about 12-15 minutes the mixture will get cooked and thicken. Take a spoonful of it and spread it on counter-top. If it sets in a minute, it is ready to spread. Else cook for a couple of minutes more until it is ready. 4. Once the mixture is ready, spread the mixture over the greased thali or your kitchen counter top as thinly as possible while the batter is still hot and leave it to cool. 5. When completely cold, roll the layer towards you to make a long thin roll. Cut the roll into one-inch pieces. Arrange them on a plate. 6. Heat the oil in a pan, add the mustard seeds, curry leaves and sesame seeds. When they begin to splutter, pour over the Khandvi. 7. Garnish it with coconut, and chopped coriander. Serve. somehow i have a bit hesitation for trying out khandavi.. you have made it just awesome.. Yes, cooking the batter to right consistency is the tricky part of this preparation. Love it as a snack and can even eat for a meal. This is my favorite gujarati dish :) You have made them perfect and it looks so inviting.. It is little tricky dish I even make them in microwave. Lovely presentation jyothi !! I haven't tried making khandvi yet. I also felt that the consistency is a tricky one. I love this Gujju delicacy , but lack patience to make it . Of corse I have made it only once for the blog , looking at this outstanding plate , I feel like making it . Super ! Though I have made it only once, I enjoyed it so much when it was made..I am hoping I will get back to this sometime soon again..
After dhokla Khandvi is my second favorite Gujju snack. Perfectly rolled and shaped Khandvis. 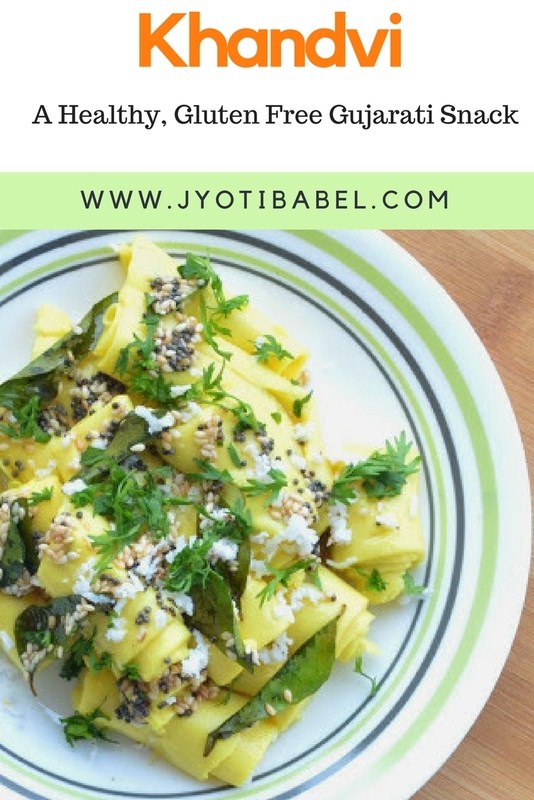 Khandvi, these dish is a super duper healthy snacks and the new clicks looks absolutely stunning Jyothi. I remember the day I made khandvi. I got it perfect after a few tries and loved it to the core. Yours looks so perfect..